While I’ve not yet read ALL of the books out my Christina Lauren, I have read and enjoyed quite a few of their books so far, and I’m always interested in finding something new by these ladies. It’s been too long since I read their last book, Roomies, so I couldn’t wait to get started on Love and Other Words. This book was so good you guys! I’m so glad that I had the opportunity to read it! I loved almost all of the characters in this story. Macy was extremely relatable to me, and I love her love for books. I also love the relationship she had with her father. It was so sweet. I also though Elliot was super sweet as well, and he also has a pretty awesome family. I loved watching the relationship grow between them over the course of the book, both in the past and in the present, and I totally didn’t want their story to end! Though I had a review copy of this book, I optioned to read along with the audiobook, and that was seriously the best decision ever. I’ve listened to a few books narrated by Erin Mallon so far, and I really enjoy having her read these stories to me. I’m looking forward to listening to more audiobooks read by her soon! Overall; Christina Lauren definitely has another hit on their hands with Love and Other Words, and this one is definitely one of my faves by them so far. I still need to read a few of their other newest books, Dating You/Hating You and Autoboyography are on the top of my list, and reading Love and Other Words has made me super excited to get started on those as soon as possible. I can’t wait! 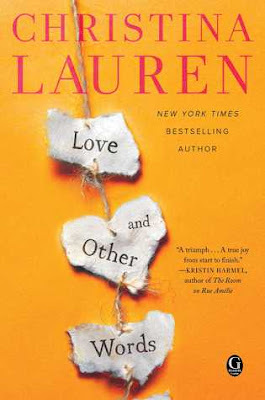 If you’re a fan of contemporary romance, or just a fan of Christina Lauren in general, do check out Love and Other Words! I hope you enjoy it just as much as I did.